This project combined different lists of available BSc, MSci and MSc dissertation topics within the School of Mathematical Sciences into a single QMplus “one-stop project shop” (click here to access the resource) to improve the student experience, in particular, by facilitating search by subject area or level and clearly displaying the required prerequisites and background knowledge. The new dedicated database built using the QMplus Database Tool will also be easy to maintain in the future, allowing the update of project proposals and the addition of new ones. Students on the MSc Mathematics undertake a 60-credit dissertation module covering a research-level topic. Deciding on the area of this project is an important part of the process and occurs early in the academic year. In fact, the Postgraduate Taught Experience Survey (PTES) specifically asks about this preparatory phase by asking students to rate their agreement with the statement “I am happy with the support I received for planning my dissertation / major project (topic selection, project outline, literature search, etc)”. Within SMS, there is also a core project module for the integrated MSci and an elective one in the final year of the BSc. Many areas of mathematics are suitable for projects at all three levels (BSc, MSci, and MSci) whereas others may be restricted to students on a particular programme. In the past, the project selection was slightly confused – in particular, there were two separate lists of MSc topics offered by staff (one web-based and one on QMplus) and, in addition, many projects also appeared in the list of MSci/BSc topics with an indication that they were suitable for MSc. This academic year the lists were combined into a crude single “repository” in the form of a book with chapters corresponding to individual staff. The E-Learning project provided additional resource and valuable student perspective to convert this repository into a more user-friendly database form which allows searching (see image below) by level and/or topic area (especially for MSc students, many staff names may be unknown) as well as displaying project outlines and the required background knowledge in a uniform format. Expertise from the E-Learning Unit and valuable advice from Dr Francis Wright (who had previously worked on another database project in SMS) were used to create the template for a database displaying projects in a list or as single items and offering advanced facilities for searching and filtering. The E-Learning Assistant (a current MSc student) helped us to determine appropriate database fields and understand how students would search for a suitable project. 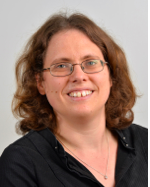 She was also responsible for all the hard work of inputting existing projects into the database and converting information (such as references) into a consistent format. Finally, she suggested text to be displayed as user instructions to students and created comprehensive documentation for staff on how to edit database entries and add new ones. 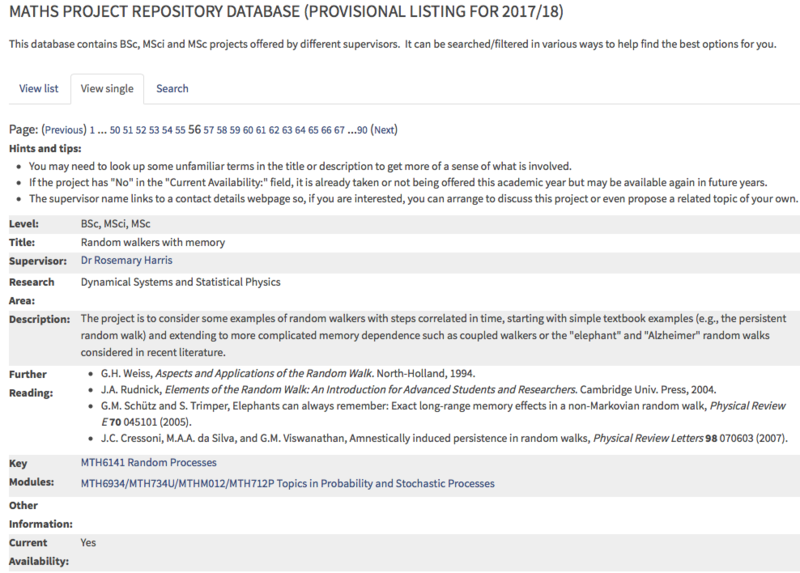 We now have a well-presented database (see images below) which should help students to see available projects in areas of interest without relying so much on supervisor names. Hopefully this will have the added benefits of spreading the supervision load more evenly among staff and showcasing the kind of topics offered to prospective students. Although the road-testing of the database for actual project selection will not come until the new academic year, one member of staff has already commented positively: “That looks really really good. I think it will save a lot of staff time as students will be able to pick projects much more independently than before.”. As with any project, good communication and documentation is key – especially when Moodle doesn’t always seem to behave in an intuitive fashion!